"Don't be fooled! Make believe kayak brands from the Big Box Store are NO Bargain... The Box store makes up a brand name and has the kayak made in China or Thailand. The container of kayaks from China has no parts in it. The Box store certainly stocks no parts. When your seat and footbrace breaks or you lose the hatch no replacements are available. We can repair the kayak you bought from us and get you back on the water. Just like for the last 40 years, we can phone our rep (a real live person) at Old Town, Perception, Wilderness Systems or Current Designs and get service and parts for you. We get calls all the time from people trying to find parts for those "unique" box store kayaks, unfortunately parts are just not available, anywhere. What will you do WHEN your seat, footbrace or backrest BREAKS ? You can't even get a cockpit cover or spray skirt to fit them. We call them "white elephants"; cheap box store kayaks which turn out to be a costly mistake and provide a hobby of frustration rather than fun." Old Town Shipping Special to your Home OR to your nearest Forward Air Freight Terminal. Kids, this is your boat. And what a performer! We designed Jr. to be nimble and maneuverable for the smaller paddler. Extremely efficient for its size, this lightweight kayak glides well and tracks straight. You'll also find plenty of stability for those family splash fights. Of course small arms can get tired after all of that paddling and splashing, so we also included our innovative Tag Along Tow System, making it easy to tow 'em to shore if need be. Poly Heron Jr 7' 5" 25" 10.5" 26 lbs. 35" x 16.25" 115 lbs. Old Towns Linear Polyethylene provides high durability at an affordable price, ideal for recreation kayaks. Before you spend good money for a No-Name kayak at the big box store we urge you to test paddle an Old Town Heron. A well made, affordable kayak from a name you can trust. Oak Orchard has Old Town parts in stock and can get you back on the water. Big box store kayak? -no parts. The Old Town Heron combines comfort and features at an affordable price. Compact and sporty, the Heron is an easy-to-handle kayak that you can maneuver. There's lots of room in the cockpit without being bulky plus great stability, so you can relax! A great choice for anyone seeking an affordable, lightweight kayak for cruising on lakes, ponds and streams. Designed to perform...the Old Town Heron will not disappoint. Poly Heron 9XT 9' 6" 28.5" 13" 37 lbs. 19" x 39.5" 300 lbs. Poly Heron 9gtx 9' 6" 28.5" 13" 37 lbs. 19" x 39.5" 300 lbs. Poly Heron 9 9' 6" 28.5" 13" 37 lbs. 19" x 39.5" 300 lbs. The Old Town Heron combines comfort and features at an affordable price. Moving up to an 11ft kayak is a good idea if you want extra glide, tracking, leg room, or higher capacity. The 11ft Heron's are perfect for beginning and recreational paddlers who may want a little extra in an entry level kayak. Designed to perform...the Heron series will not disappoint. Poly Heron 11XT 11' 28.5" 13.5" 41 lbs. 18.625" x 39.375" 325 lbs. Before you spend good money for a No-Name kayak at the big box store we urge you to test paddle an Old Town Heron Angler. 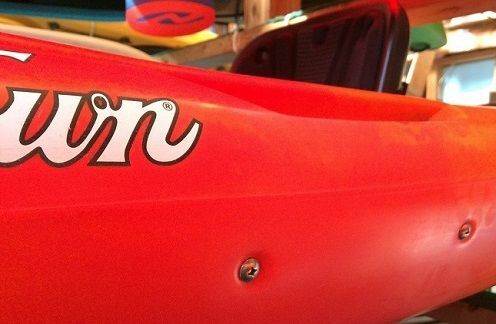 A well made, affordable kayak from a name you can trust. Oak Orchard has Old Town parts in stock and can get you back on the water. Big box store kayak? -no parts. Compact and sporty, the Heron Angler series is an easy-to-paddle kayak that can maneuver perfectly into your favorite fishing spot. There's lots of room in the cockpit without being bulky plus great stability, so you can focus on fishing! A great choice for anglers who are seeking an affordable, lightweight kayak for fishing and cruising in calm waters. Heron 9 Angler options: Pad for seatback, Knee pads, Scotty RodHolder, Paddle holder, Deck bungees. Poly Heron 9 Angler 9' 6" 28.5" 13" 39 lbs. 39.5" x 19" 300 lbs. Poly Heron 9gtx Angler 9' 6" 28.5" 13" 39 lbs. 39.5" x 19" 300 lbs. The Vapor 10 provides new paddlers all they'll need for a stable, efficient and comfortable ride. With features like this, getting a workout is as easy as grabbing your water bottle and heading to your nearest body of water. Poly 10' 28.5" 16.75" 48 lbs. 19.5" x 48" 325 lbs. Old Town's 10ft Vapor comes in a basic version, a GTX version and an XT version. The GTX or XT upgrade has a padded seat and padded backrest. Included with the GTX version is a Flip hatch with tank well. 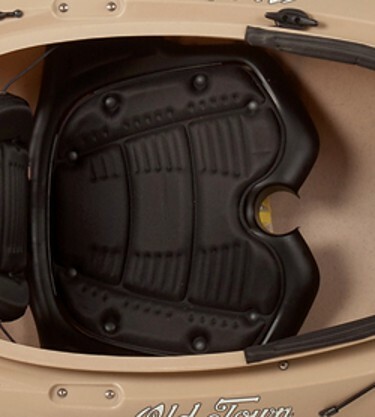 The compartment in the Flip hatch version is a bit smaller but the opening is much larger and easy to access while you are seated in the kayak. While the XT includes a Click Seal hatch version with bulkhead offers very secure storage but not within reach while seated. We also stock an Angler version of the Vapor 10 -yep, you guessed it, the "Vapor 10 Angler" or the "Vapor 10GTX Angler" -the "GT" means it has the upgrade of padded seat, padded backrest and the Flip hatch with tank well. We can show you ALL the features in our showroom. 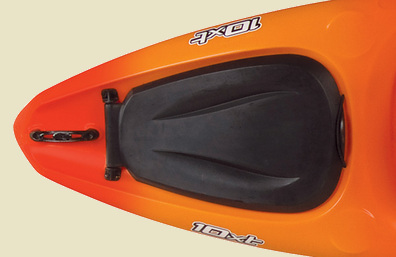 The Old Town's 10ft Vapor Angler is made wider and deeper than other 9 to 11ft kayaks. This makes for a super stable fishing platform for a full grown adult. Old Town makes kayaks in the USA that are tough enough for rocky streams and hard to get to spots. The extra volume of this 10ft Angler kayak means you'll float higher in the water and still be paddling when others run aground. The GTX version has a nicely padded backrest for Extra comfort. 2 fishing rod holders, anchor and trolley. The GTX version has a Flip hatch over the rear tank well is easily reached from a seated position and makes for a great cooler OR storage spot for your gear. UN-padded backrest, No Flip hatch. Poly 10' 28.5" 16.75" 49 lbs. 19.5" x 48" 325 lbs. The Vapor 12s provides new paddlers all they'll need for a stable, efficient and comfortable ride. Poly 12' 27.5" 16.25" 54 lbs. 19.5" x 47" 325 lbs. Old Town's 12ft Vapor XT is an upgrade over the more basic 12s version. The Vapor 12XT includes a Click Seal hatch with a bulkhead (for dry storage). It also has the padded seat, with a nicely padded backrest for Extra comfort. Stop in, We can show you ALL the features in our showroom. 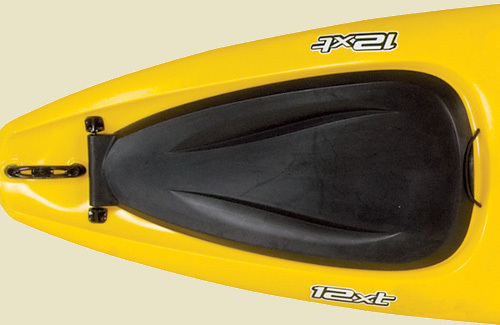 Old Town's 12ft Vapor Angler is made wider and deeper than other 10 or 12ft kayaks. The extra volume of this 12ft Angler kayak means you'll float higher in the water and still be paddling when others run aground. Poly 12' 28.5" 17.25" 56 lbs. 19.5" x 49" 375 lbs. Old Town's new Loon series is a HUGE upgrade over previous generations in terms of stability, tracking and comfort. The Loon 106 includes a Click Seal hatch with a sealed bulkhead (for dry storage and safety). It also has the new ACS2 padded seat, with a very nicely padded adjustable backrest for Extra comfort. Stop in, We can show you ALL the NEW features in our showroom. Also available in an Angler version. Three Layer Polyethylene 10' 6" 31" 17.5" 52 lbs. 56" x 23" 325 lbs. Old Towns 3-Layer Linear polyethylene technology provides exceptional stiffness and durability along with built-in flotation at an affordable price. The Loon 120 includes a Click Seal hatch with a sealed bulkhead (for dry storage and safety). Three Layer Polyethylene 12' 30" 15.25" 54 lbs. 56" x 22" 375 lbs. The Loon 126 includes a Click Seal hatch with a sealed bulkhead (for dry storage and safety). Stop in, We can show you ALL the NEW features in our showroom. Also available in an Angler version (shown). Three Layer Polyethylene 12' 6" 31" 17.25" 59 lbs. 56" x 23" 450 lbs. We worked closely with our Pro Staff to make the Predator the ultimate kayak for sportsman. Like its sibling, the Predator MX was completely engineered - below and above the waterline - to deliver the perfect platform for fishing and on-water sporting. The Predator MX, or Mixed Water, features a slightly more rounded hull, designed for moving water conditions without sacrificing the Predator's class leading stability and performance. The Predator MX also features a spacious Exo-Ridge deck providing the perfect standing platform, room for extra gear or a furry companion. Poly 12' 34" 48" 15" 82 lbs. 25.5" x 16.5" x 7" 400 lbs. The Predator 13 was completely engineered - below and above the waterline - to deliver the perfect platform for fishing and on-water sporting. Our Pro Staff examined seating, rod placement, paddle holders and total "fish-ability" and incorporated it all into this revolutionary boat. Something changes when you take your fishing to the surface level. It alters the playing field and provides a more personal connection to your environment - and the battles that take place there. You just may find the closer you get to the water, the further you can take your game. Predator 13 13' 2" 33.5" 48" 15" 86 lbs. 29.5" x 19.5" x 7" 425 lbs. The XL is wider than our other Predator kayaks, for the ultimate fishing platform. Want more than a great fishing platform? crank up the motor and go! Predator XL Flat Floor Console 13' 2" 36" 48" 15" 98 lbs. 29.5" x 19.5" x 7" 600 lbs. Predator MK MK Motor Console 13' 2" 36" 48" 15" 117 lbs. 29.5" x 19.5" x 7" 600 lbs. Predator PDL PDL Pedal Console 13' 2" 36" 48" 15" 117 lbs. 29.5" x 19.5" x 7" 500 lbs. The Vie II is the perfect boat for couples and young families. Its compact size and open cockpit make it very user friendly. With the huge cockpit, jumping in and out of the boat is easy, and children or pets are close at hand. Excellent stability and strong tracking make this a very safe and fun boat to paddle. The Vie II is an ideal platform for bird watching, fishing or exploring calm bays and coves. The Vie II fits easily on the deck of sail and powerboats, or atop RVs, under cottage decks or on the roof of almost any car. Superpoly 12' 6" 28" 59 lbs. 79" x 18" 450-500 lbs. The Twin Heron is a truly unique tandem kayak. Featuring the innovative Auto Trim Hull, the Twin Heron is a tandem that performs well when paddled solo. The Auto Trim Hull is designed to prevent the bow from popping up when someone is seated solo in the stern seat. And, if that's not enough, you can completely remove the front seat making it perfect for your dog to ride along or easy access to your hunting or fishing gear. The Twin Heron is a great option for the outdoors family looking for a versatile craft. Three Layer Polyethylene 13' 6" 31.5" 60 lbs. 23" x 93.5" 450-500 lbs. Three Layer Polyethylene 13' 6" 31.5" 62 lbs. 23" x 93.5" 450-500 lbs. A family favorite for more than ten years, the Loon 111 is a recreational kayak that makes you feel confident on the water. The Loon has one of the largest cockpit openings allowing you to get into and out of the kayak with ease. It has the same classic looks, unparalleled primary stability and excellent tracking ability that made it one of America's most popular recreational kayaks. Three Layer Polyethylene 11' 1" 28" 45 lbs. 17" x 55" 275 lbs. 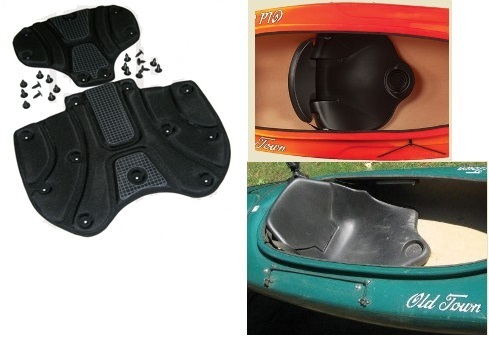 Easily add footbraces to your kayak with this complete kit. Used on most Necky, Old Town and Ocean Kayaks, these 22" long footbrace tracks are truly innovative. Featuring an easy to reach trigger, allowing you to quickly adjust your foot pedals -while seated in your kayak. 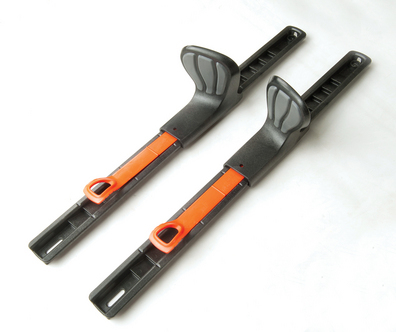 By adding footbraces to your kayak you provide a more secure fit and more efficient propulsion. They will not bind-up when sand gets in the tracks. These footbraces are compatible with a rudder. Note; to install in a sit-on-top kayak you'll need a hatch near by so you can reach and tighten nuts at each end of track. 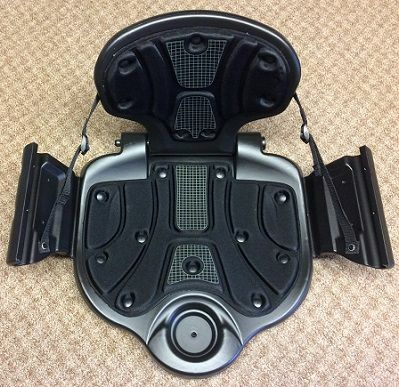 Includes 22 inch long footbrace tracks, foot pedals, and mounting hardware. Easily add or upgrade footbraces for your kayak with this complete kit. 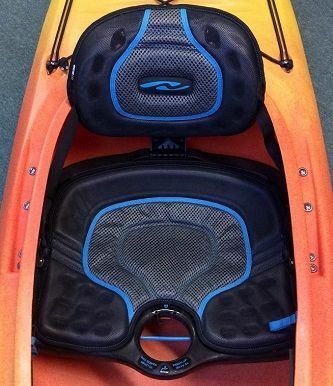 We have used this seat in Loons, Dirigos, Vapors, Herons, Otters and many other kayaks. Makes a great replacement OR upgrade seat with comfort and very good back support. Notice the backrest is tall, well padded. You can easily adjust the backrest with the support straps on each side. The second pic is a custom Bell/northstar Rob Roy solo canoe we upgraded several years ago for our customer. Third pic shows factory mounting in an Old Town Dirigo 106 or 120. Typically, this seat is installed by bolting through the side wall of the kayak and through the vertical support arms. OR the support arms may be tilted outward to accommodate a wider kayak hull (up to about 30" wide, at which they are @ 6" above the floor). AND even some solo canoes [where our customer thought the standard canoe seat was too high and tippy]. Seat Pan: 18" wide, 20" long and about 2" thick. Support Arms: 6" high, L: 9" long. Backrest: 15" high, W: 12" wide. 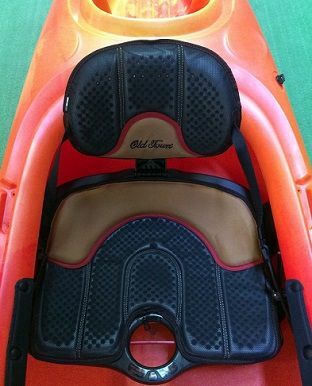 The Deluxe Flex seat is an upgrade to the standard Flex seat that comes in Old Town Trip, Heron or Vapor kayaks... The Deluxe Flex seat is clearly better than the standard Flex seats in many ways. The Deluxe Flex Backrest is more sturdy and also more comfortably padded than the standard. The seat pan of the Deluxe Flex is more contoured and better padded than the standard. The mounting brackets that hold this seat are bolted into the kayak vertically through the kayak deck, next to the cockpit combing (two holes per side; @ 3" on center, front to rear). Each bracket is about 8" tall. NOTE; the mounting brackets for this seat need to be mounted about 23" to 25" apart from each other. (For this measure from a seat mounting screw on one side, across your kayak's cockpit, to a seat mounting screw on the other side). The Seat Pan is about 20" Long and 21" wide. If you have questions on how this seat may work in your kayak you may call our customer service with questions at ph;(585)682-4849. The Deluxe Flex seat pictured at left is in an Old Town Vapor. We have also used this seat in the Necky Rip and Old Town's Heron and Loon 106, 120, 126. Kayaks vary; this seat does not fit in all kayaks. YOU need to measure YOUR particular kayak to see if this seat's 23" to 25" mounting width will fit. Finally, after many requests and a great deal of begging... The factory has agreed to offer the next level of comfort in a kit form... Active Comfort System 2 (ACS2). ACS2 is clearly better than the older ACS seats in many ways. This is the current and best type of seat used in the best Old Town and Necky models that have wider cockpits. Designed for all day comfort the ACS2 seat features a visible, intuitive adjustment system, multi-laminate construction for optimal support and softness. Enhanced seating surface gives superior air-flow and drainage. This sturdy new seat provides that "one with the boat" feeling along with tremendous comfort. This four-way adjustable seat tailors individual backrest height, thigh support, lumbar support and backrest angle to provide a truly customized ride. ACS2 seat kit will replace your old time seat. Also replaces the grey Extrasport Xtra Comfort seats in Necky and Old Town kayaks that have wider cockpits. If you have an older Dirigo kayak with Extrasport Xtra Comfort seats AND ratchet control knobs (these knobs are in the way and need to be removed). The brackets that hold the seat are bolted into the kayak vertically through the kayak deck, next to the cockpit combing (two holes per side; @ 3" on center, front to rear). Each bracket is about 4.5" tall (from the seat pan) but can be adjusted 1/2" higher OR 1/2" lower to accommodate different kayak depths. This seat's mounting brackets have inner mounting holes designed for self tapping screws at 21.5" apart AND outer mounting holes designed for nut/bolts at 24" apart. You may choose to use either the screw hole OR bolt hole, as you see best for your kayak. This ACS2 Seat Pan is about 17" Long and 20.5" wide. Overall seat length is 20" and overall seat width is 23". Foam pads on the bottom of this seat may be shaved down OR added to, in order to fit hull shape. The backrest is 11" tall by 15" wide, contoured for lumbar support, adjusts up/down, adjusts for lean. The ACS2 pictured at left is in an Old Town Vapor. We have used this seat in the Necky Rip and Old Town's Heron and the new Loon 106, 120, 126. Kayaks vary; this seat does not fit in all kayaks. YOU need to measure YOUR particular kayak to see if this seat's 21.5" OR 24" seat bracket mounting width will fit. This is a smaller version of the ACS2 seat, for a less wide cockpit. ACS2 is clearly better than the older ACS seats in many ways. This is the current and best type of seat used in the best Old Town and Necky models that have less wide cockpits. ACS2 seat kit will replace your old time seat. Also replaces the grey Extrasport Xtra Comfort seats in older Necky and Old Town kayaks. Each bracket is about 4.75" tall (from the seat pan) but it can be adjusted 1/2" higher OR 1/2" lower to accommodate different kayak depths. NOTE; the mounting brackets for this seat need to be mounted about 18.75" OR 20.75" apart. This seat's mounting brackets have inner mounting holes designed for self tapping screws at 18.75" apart AND outer mounting holes designed for nut/bolts at 20.75" apart. You may choose to use either the screw hole OR bolt hole, as you see best for your kayak. This smaller ACS2 Seat Pan is about 18" Long and 18" wide. Overall seat length is 19.25" and overall seat width is 19.75". Foam pads on the bottom of this seat may be shaved down OR added to, in order to fit hull shape. The backrest is 9" tall by 14.5" wide, contoured for lumbar support, adjusts up/down, adjusts for lean. The ACS2 pictured at left is in an Old Town Sorrento. We have also used this seat in the Necky Manitou Sport and Old Town Dirigo. YOU need to measure YOUR particular kayak to see if this seat's 18.75" OR 20.75" seat bracket mounting width will fit. ACS2 is clearly better than the older Necky seats in many ways. This is the current and best type of seat used in some of the best Necky models. ACS2 seat kit will replace your old time seat. Also replaces the grey Extrasport Xtra Comfort seats in older Necky kayaks. NOTE; the mounting brackets for this seat need to be mounted about 17.5" to 18.5" apart. The mounting holes in this seat's brackets are designed to secure the seat into your kayak with four included 1/4-20 ss nuts/bolts. This smaller ACS2 Seat Pan is 18" Long and 18" wide. Overall seat length is 19" and overall seat width is 20". Foam pads on the bottom of this seat may be shaved down OR added to, in order to fit hull shape. The backrest is 10.5" tall by 15" wide, contoured for lumbar support, adjusts up/down, adjusts for lean. The ACS2 Necky seat pictured at left is in a Necky Manitou 14. YOU need to measure YOUR particular kayak to see if the 17.5" to 18.5" seat mounting bracket width of this seat will fit. 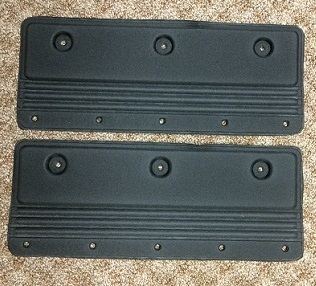 Hatch cover to fit over the stern tank well space on the Vapor 10 or Vapor 10 angler. Hatch cover to fit over the stern tank well space on the Vapor 12, Vapor 12S and Vapor 12 angler. Old Town's special design foam seat pad offers enough pad thickness to make a day on the water as comfortable as in an easy chair. The non slip surface keeps the paddler from sliding around in rougher waters enhancing control of the craft. Durable and easy to clean. Fits Old Town's current blow-molded seat perfectly (as in orange kayak). Fits Old Town's much older roto-molded seat, but not perfectly (as in green kayak). Includes one seat pad, one backrest pad and installation instructions. Pad for Vapor Seat only, Backrest pad sold separately. 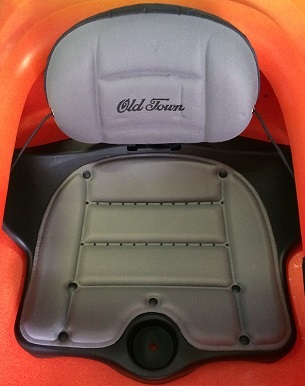 Old Town's special design foam seat pad offers enough pad thickness to make a day on the water more comfortable. The non slip surface keeps the paddler from sliding around in rougher waters enhancing control of the craft. Durable and easy to clean. This is one black color Old Town Vapor seat pad. Easy Install. No drilling. Hardware included. Pad for Vapor Backrest only; Seat pad sold separately. Many Vapor kayaks are sold without a pad on the backrest (ouch!). Why not go in style and comfort. Old Town's special design foam backrest pad offers just enough pad thickness to make a day on the water as comfortable as in an easy chair. Durable and easy to clean. Note for BEST Fit: Order a light grey back pad if your Old Town has a light grey seat pad. Order a black back pad if your Old Town has a black seat pad. Pad for Heron Seat only; Backrest pad sold separately. Old Town's special design foam seat pad offers just enough pad thickness to make a day on the water as comfortable as in an easy chair. The non slip surface keeps the paddler from sliding around in rougher waters enhancing control of the craft. Durable and easy to clean. This is one black color Old Town seat pad. Pad for Heron Backrest only; Seat pad sold separately. 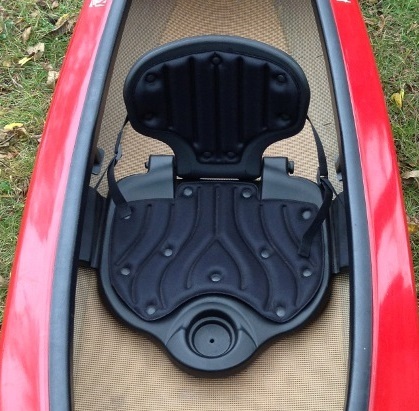 Many Vapor kayaks are sold without a pad on the backrest (ouch!). Why not go in style and comfort. Knee Pads provide padding inside the cockpit so your knee are not against hard or rough edged plastic. 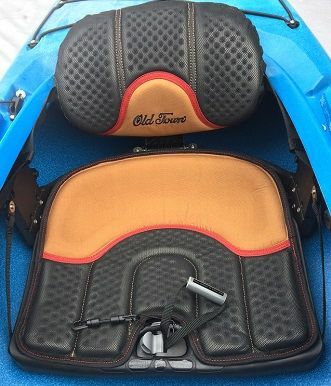 Found on good kayaks like Old Town Heron and Vapors; fits tons of different brands and models. Old Town's special design pad offers enough pad thickness to make a day on the water comfortable. 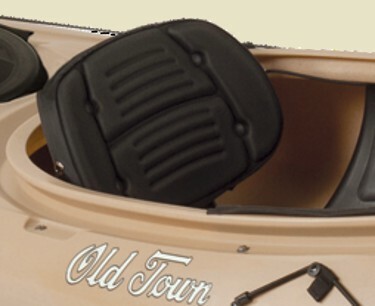 Old Town's special design pad offers enough pad thickness to make a day on the water comfortable. Durable and easy to clean. Five pins secure each pad to the cockpit rim and three bolts hold the pad up under the deck. Easy Install. Drilling is required (unless you're just replacing old ones mounted the same way).